To celebrate the longer days and balmy nights of summer the Four Seasons Prague hotel is launching an exotic collection of eight cocktails inspired by fragrant gardens in foreign lands. The colourful summer-themed cocktail collection features a series of unique ingredients including Japanese watermelon, Portuguese shrub, kefir lime leaves and raspberry caviar. The ingredients are carefully sourced by the bar team before being selected and blended with craft liqueurs and premium spirits. 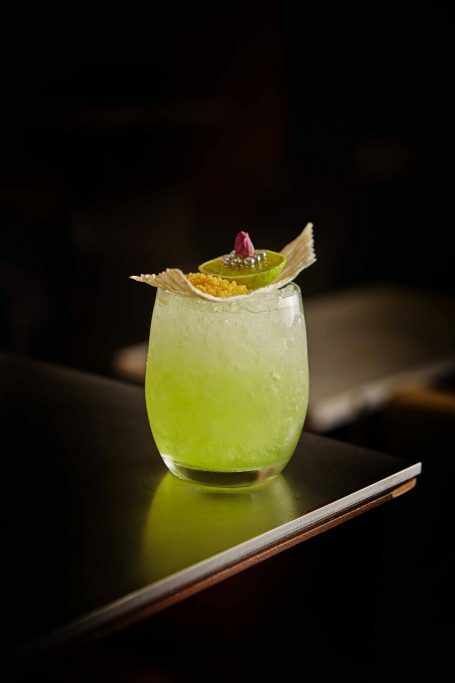 Each drink is then finished off with bright avant-garde garnishes reflecting the character of the drink. The result of this magical alchemy is a rainbow of summer drinks that delight and entice the senses. Cocktail highlights include the Capri cocktail which will transport you to island life via a smooth mix of basil, mandarin and the Limoncello of the south, the Jasmin which will spice up your palate with its exotic taste of lychee, passion fruit and prosecco all served over ice shell, topped with raspberry caviar and the Innuendo which combines the sweet, peachy notes of Rin Quin Quin with the subtle notes of apples and pears found in calvados, all mixed with morrocan spices. Other cocktails to discover include the lavish Ziya cocktail created with London dry gin, kaffir lime leaves and herbal notes of chartreuse over a large chunk of ice and the Calimero which combines passionfruit, rose and lime leaves served in a delicate ostrich egg with an unexpected nest of pink candy floss to lift your spirits.